" Hopefully, it can minimize inundation in future"
The drains of Jalan RE Martadinata, in front of Karapan Sapi Park, Tanjung Priok Urban Village, North Jakarta were dredged by 10 personnel of PPSU. 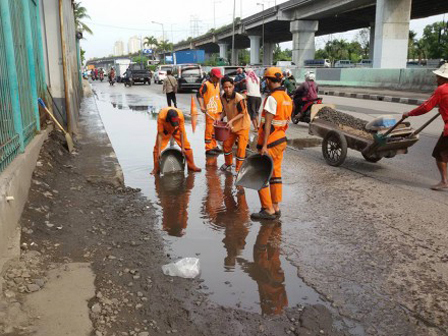 Tanjung Priok Urban Village Head, Ma'mun disclosed, when it rains, water on the street couldn’t flow into the drain and caused inundation, including Jalan Enggano. "To smoothen water, we send personnel to dredge the drain," he expressed, Ma'mun, Thursday (2/23). He admitted the drains on two sides of the street including Jalan Enggano until Jalan Yos Sudarso have been dredged from mud. And now it can accommodate water in large quantities. "Hopefully, it can minimize inundation in future," he hoped.